Click here for information about memorial glass. We offer the opportunity to have a hands-on glass blowing experience. Our studio is open to the public so that you and your family can have the chance to blow your own heirloom glass ornament or paperweight. With the help of our professional artists, you may choose colors, assist with working the piece, and actually trap your own breath in glass. Cost starts at $43 per design (3 styles to choose from), with a $5 discount for groups of 10 or more. Although walk-ins are welcome when time permits, we request that you make an appointment for glass blowing. Call us at 423.265.2565 for availability. We make designing and blowing your own heirloom quality keepsake fun and easy for both adults and kids alike. Choose from our design selections and colors, then turn your glass in a 2000° furnace. Blow through a pipe to inflate your design and watch it take shape before your eyes. Let it cool overnight in a special 800° oven, and it's yours to take home. Our glassblowing experience is perfect for a lady's night out, a day of family fun, or a team building exercise! Please take a moment and watch our video or check out the three step process below for further information. Make an appointment and head to the gallery to select the type of glass you'd like to create. From there, you will enter the shop where you will choose the colors for your design from our large selection. Watch as your glassblower gathers the molten glass from a furnace and adds the colors you have chosen. Your glassblower will hand you the blowpipe so you may turn your molten glass inside the 2000° furnace. As you spin the blowpipe, you will be able to feel the movement of the glass while it is still in its molten form. Your glassblower will then add a small amount of air to prepare your piece. 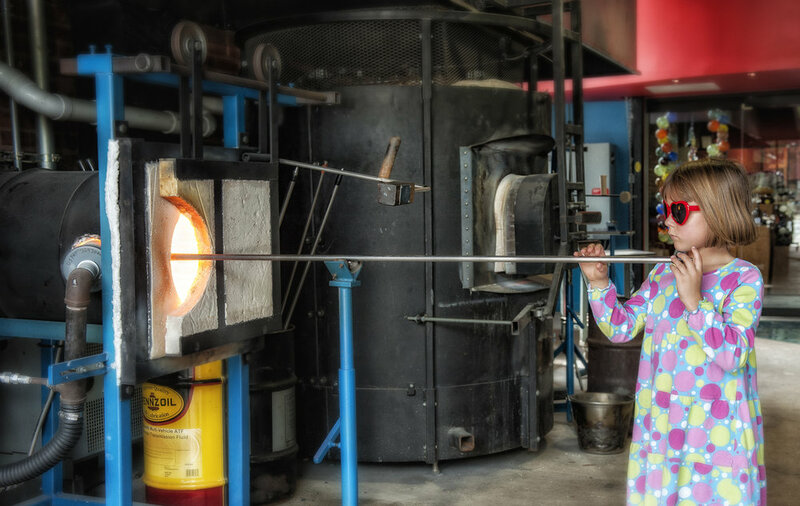 Your glassblower will attach a blowhose to the blowpipe, allowing you to blow air slowly and steadily into your one-of-a-kind keepsake, and watch it take shape before your eyes. Your glassblower will fashion a hanging loop, and place your piece into an 800° oven for it to slowly cool overnight.